Batman and the Insurgency concoct their latest plan to take down Regime Superman, which involves Hawkman fighting Mongul and the Insurgency getting the drop on Cyborg. Story - 0: Cyborg is probably the most underrated hero on the Justice League roster, not only in this series, but in the canon series as well. His abilities would allow him to defeat someone as fast as the Flash, while sitting at a computer screen on the other side of the planet, and asleep at that. Trouble is Cyborg was thrust onto the League for inorganic reasons that should be apparent to the novice, and has been treated like a glorified toaster that breaks apart when it's doused with water. The idea of the Insurgency sneaking up on someone with sensors plugged into sensors is laughter, but that goes hand in hand with Batman and company traveling underground in a lead lined tunnel, which, even if Regime Superman was dumber than love, he'd be able to spot it just because he couldn't see through it, and as it would have to be powered electrically, Cyborg could detect the power usage of a rail line coming from of the "grid". Many have bemoaned the powers that superheroes have, in a unique bit of irony, but when used well, with some actual thought, it makes for interest storytelling, which Injustice has given up on at this time. Mongul. What a sad fate has befallen such a great Superman villain, who has become little more than a stock character. When Mongul was introduced, in the much beloved Bronze age of comics, he was a match for Superman and only Superman. He defeated Superman, put him through paces, and was his antagonist in one of Superman's long held top stories. Over time he's been reduced to little more than a brawler, a bum of the month, and worst, a Green Lantern villain. Mongul fighting Hawkman in a match that lasts longer than three seconds is pathetic and shows such a lack of understanding of the character. 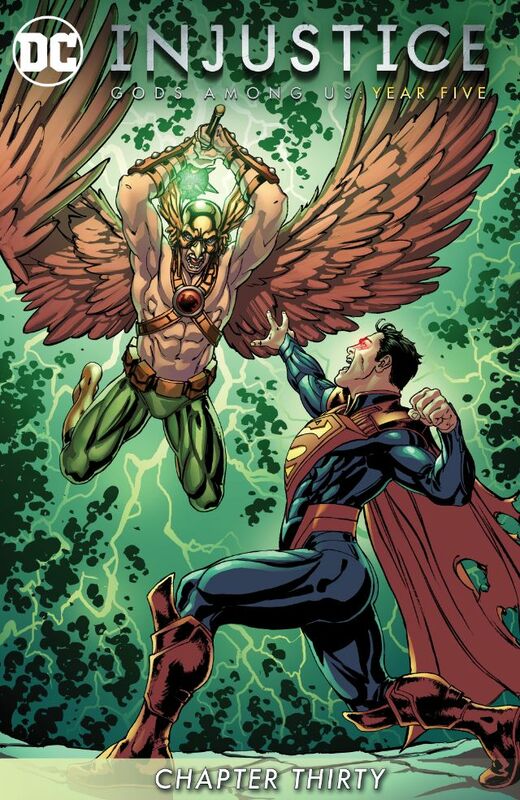 Mongul would make Hawkman fight his underlings first, and then if he survived, he'd jettison Hawkman away like so much jetsam, excoriating him for even trying. Mongul wouldn't waste his time with anyone less than Superman. The idea that Mongul just happens to have a valued piece of Kryptonite is just lazy beyond words. Mongul's weapon of choice is the Black Mercy, but I suppose that would require more thought than Kryptonite or a green pill. Newton's law is all that keeps this series going. Art - 3: The fight sequences are handled very well, trying to give the reader the best sense of how Hawkman would survive such an encounter... though using his obvious advantage of flight might have served him best here. Cover Art - 3: Hawkman looks crazed and not enraged, there is a difference. It's striking as Regime looks solidly rendered, while Hawkman seems phoned in.